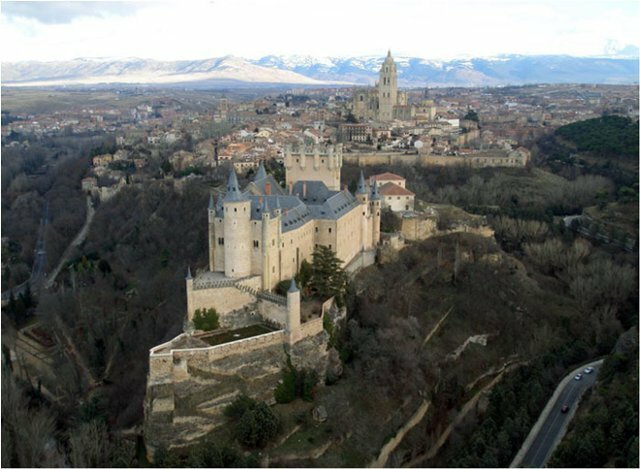 The Alcazar of Segovia is one of the most remarkable castles of Spain. It only takes a little imagination to turn it into a legendary place. The fortress, whose silhouette resembles a ship, enjoys a privileged situation, at the tip of a rocky spur, at the foot of which the Eresma and Clamores rivers meet. Probably inhabited since the Celtic times, the fortress was turned into Alcazar (royal residence) at the XIII century and acquired its gothic appearance at the time of Juan I and Enrique IV. Its restoration was continuous after a major fire that happened in 1862 and that was on the verge of destroying it completely. However, in 1882, during the reign of Alfonso XII, its reconstruction began and has never been abandoned ever since. 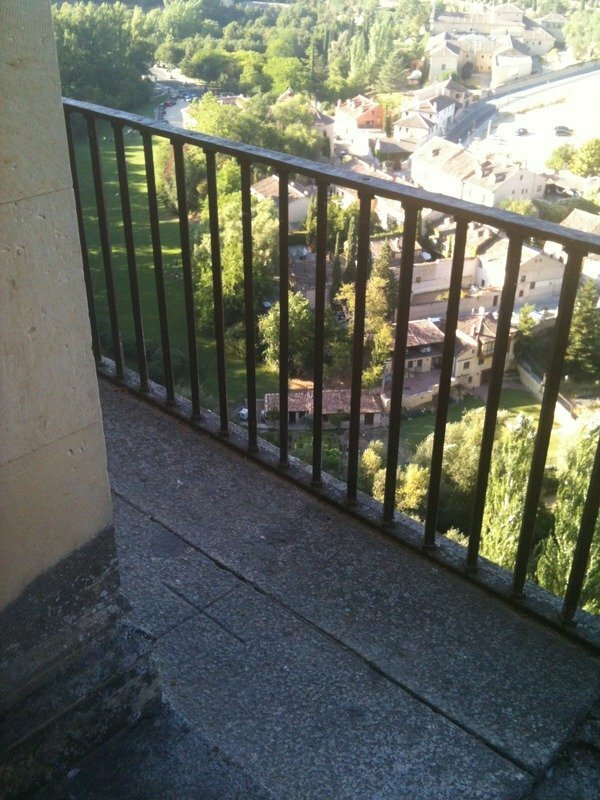 In 1475, the Alcazar was the headquarters of the signature, by the Catholic Monarchs, of the "Agreement for the governement of the kingdom" also known under the name of "Concord of Segovia", which defined the allocation of governmental functions between Fernando and his wife Isabel on their respective territories. 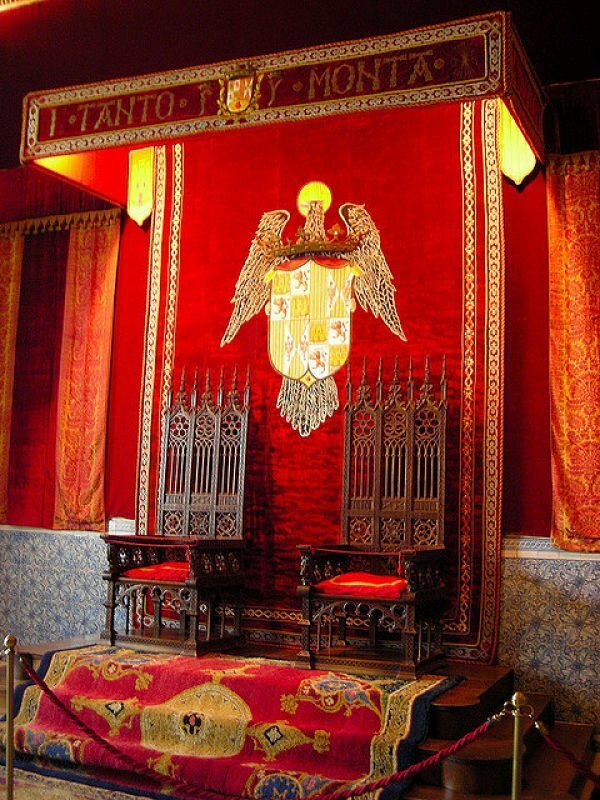 In the throne room, you can contemplate the blazons of the monarchs as well as their motto: "Tanto monta Isabel como Fernando" ("they amount to the same"). 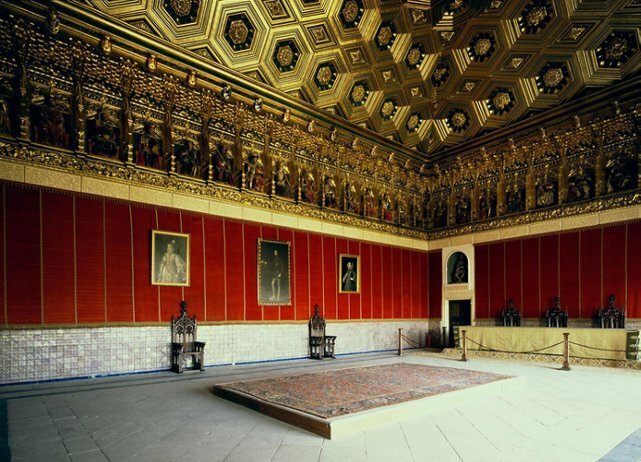 The most remarkable room of the Alcazar is the Hall of the Kings. It has an extraordinary ceiling of gold hexagons and diamonds and an original frieze, where 52 polychrome statues, in a seated position, representing all of the kings and queens of Spain. There are two versions of the legend of the Infant Pedro de Castilla, son of Enrique II. The most legendary one is saying that he slipped from the arms of his childminder and was falling down. The childminder, panic-stricken, threw herself behind him. According to the historical version, the Infant, twelve years old, would have fallen while playing ball with his friends. On the central balcony of the Hall of the Kings, a cross commemortates the Infant's death. According to tradition, a strand-shaped relief was ordered by the Queen Violante in order to humble her husband Alfonso X the Wise. His knowledge and his pride went hand in hand, insomuch that he claimed God should have asked him for advice before creating the Universe. 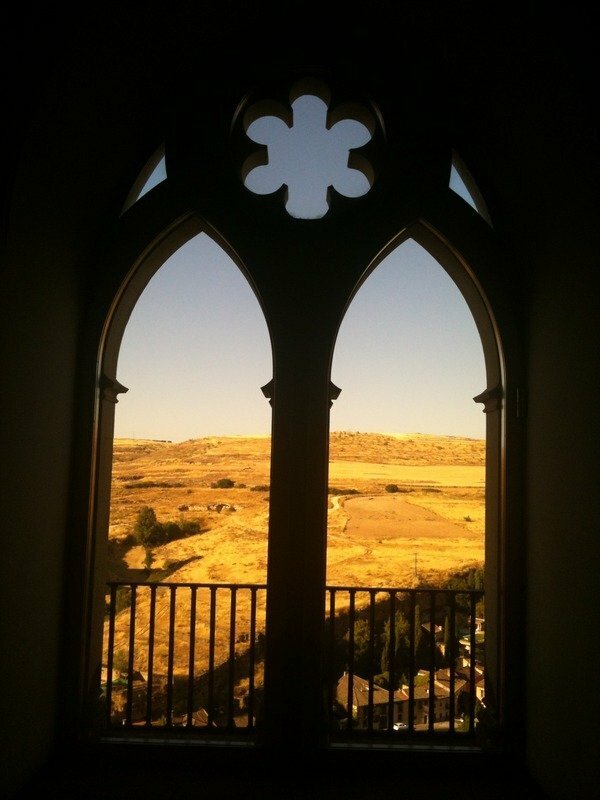 Fray Antonio of Segovia begged him to repent for his sin, but the Wise, too arrogant, refused. So a terrible storm broke out and lightning struck the Royal outbuildings and killed several courtiers. That's when the monarch gave in and did his penance. His wife took advantage of it to order an amulet to assuage God's wrath, a frieze that can be found in the Belt Room.